Most outdoor enthusiasts care for the environment and would like to take responsible buying decisions. Retailers, media and consumers ask for more and better product sustainability information. With the help of the GRV Transparency Tool, brands and suppliers can communicate the ecological and social performance of the company and the products in a transparent and easy to understand way, no matter how far they have travelled on the road towards sustainability. GreenroomVoice supports brands with the help of a basic framework on sustainability practice, to identify achievements, priorities, deliverables and progress. We are experts at translating a brand’s situation into a scientifically approved framework based on facts. No matter if a brand is big or small, nor where the brand is at. If they are a pioneer in some ways and a beginner in others. Their efforts towards a more sustainable practice will be highlighted in a way, that leads to better understanding with all stakeholders. The audience is getting ever more demanding and can benefit from clear and transparent communication to make responsible (buying) decisions. And it creates a safe space for transparent communication. 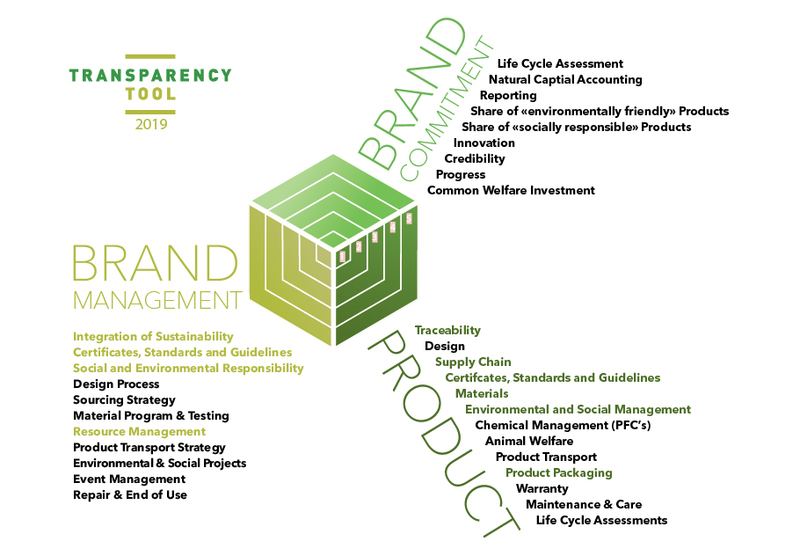 With the help of the GRV Transparency Tool framework, we can deliver a fact checked and comprehensive overview on brands and products sustainability performance. We look at Brand Management, Brand Commitment and Products including their supply chain. This places the brand’s action into a context. The scientifically approved GRV Transparency Tool delivers reliable and comparable facts. All relevant standards, labels and practice are integrated and updated regularly once a year. The results can be used to create trustworthy and comparable information for brands’ internal and external communication and saves research time for media, retail and the consumers. The three vectors we look at are Brand Management, Brand Commitment and the brand’s Products including their supply chain. To make it easy for the consumers to see how well the product does compared to others, we’ve created a point system where the products are rated as follows: BASIC gets 1-5 points, GOOD 6-10 points and BEST 11-15 points out of 15. The GRV Transparency Tool is accessible and easy to understand, and deep enough to make a holistic and verifiable statement. It enables brands to set up a confident and trustworthy communication about their CSR activities. The point of view of the GRV Transparency Tool is always “from the outside in”, so the key interest is to build a bridge between the brand and its audience. In order to understand where social and environmental engagement plays a role and how to measure it, the GRV Transparency Tool allows contextualization for experts and non-experts. The GRV Transparency Tool delivers a matrix for a brand to have a first engagement with sustainability measurement. It can be used to define a roadmap for the company’s sustainable development. A GRV Expert will spend about 2-3 hours on the phone with one or more members from the brand to go through the Brand Management and Brand Commitment parts of the questionnaire. This could be the CEO, the responsible person for CSR development or any other member of staff, who is qualified to give answers to these fields of action. After the interview, GRV will evaluate the given answers, check the mandatory proof documents and come back to the brand for more information, if necessary. The strength of the GRV Transparency Tool is the possibility to adapt it to all sizes of brands. This is why GRV doesn’t always ask for same documents as proof, and why we work with equivalents to standards and certification. Matched to the size of the brand, some standards like the Higg Index and/certain certification has a great influence on the result. On the other hand, a really small sized brand for example may not need the same amount or type of certification. In this case we ask about their practice and accept their explication based on common sense and the validity in their field of action. This process can also be a helpful learning procedure for the brands. The GRV Transparency Tool guides along the sustainability practice, which is established within the industry and identifies extraordinary engagement or priorities to move forward. Once all the questions on Brand Management and Brand Commitment Levels are answered, GRV will look at three to six specific products (sometimes more), which should be a mix between highlights for promotion and best sellers with the most impact. Once all questions from both sides are answered and we can assure validity of the given information, we will pass the result onto our advisory board to have valuable feedback. The advisory board includes members from science, NGO’s, industry and consumer groups. We will confront them with specific questions and show the results in comparison. The fully answered questionnaires stay with GRV and will only be disclosed in their entirety to the advisory board, if necessary and if the brand gives a written agreement. Mostly by then it is all clear, but on some occasions, questions do come up, which GRV then passes on the brand, always with the intention to have clarity and meaningfulness in the answers and results. With the results GRV will generate the graphics and score cards to hand them over to the brand. They will also appear on the GRV website. This way a brand can communicate in a clear, trustworthy and comparable way to their own staff as well as the external world- may it be press, retailers or directly to their customer. That’s why the GRV Transparency Tool user friendly, holistic, scientific and independent.